Alltell Offers Blackberry 7250 | BlackBerry Blast! 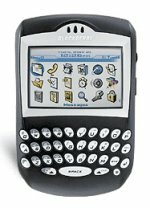 Alltel is now selling the BlackBerry 7250 Wireless Handheld in the company's wireless retail stores. The wireless handheld, which has been available in the business channel for two months, allows customers to roam on Alltel's high-speed data network with national coverage that is similar to the company's voice network. The BlackBerry 7250 is available in retail stores for $299.99 with a two-year contract and $359.99 for a one-year agreement. "The BlackBerry 7250 gives our customers a fast and easy voice and data connection when they travel," said Frank O'Mara, executive vice president of marketing for Alltel. "BlackBerry users will benefit from peak speeds of 144 kilobits per second when browsing the Internet on their device." The BlackBerry 7250 initially will be available in 300 Alltel retail stores. "We are pleased that the BlackBerry 7250 and BlackBerry Internet Service are now available to Alltel's retail customers," said Mark Guibert, vice president, corporate marketing at Research In Motion. "Our customers recognize and value the freedom of wireless connectivity in both work and personal settings and choose BlackBerry because they want the best combined voice and data experience."